Among the tuk tuks and long tail boats in the bustling city of Bangkok, Thailand, millions are searching for the route to peace. On Jan. 19-20, Franklin Graham plans to share how this life-changing peace can be found in Jesus Christ at the Amazing Love Festival in the Bangkok International Trade & Exhibition Centre (BITEC). He’s come to the country numerous times to offer humanitarian aid with Samaritan’s Purse in the midst of the refugee crisis and natural disasters, and preached there for the first time in 2013. Last month, his son Will Graham shared the Gospel on the mountainous island of Phuket, where nearly 600 people made a decision to follow Christ. Although the nation remains 95 percent Buddhist, thousands have come together in Bangkok, hoping and praying others will come to know the Lord. “God’s bringing unity to this city for the churches to work together like never before,” said Festival Director Derek Forbes, who previously oversaw the 2013 Abundant Life Festival in Chiang Mai. Over the past several decades, three Christian church denominations in the region struggled to partner together for the sake of the Gospel. In fact, many Thai pastors claim Billy Graham never held a Crusade in the area because churches couldn’t work with one another. “[The Amazing Love Festival has] been years in the making,” Forbes said, noting the previous Festival brought the churches together. “The churches were so concerned about working with each other. They’re realizing they can trust the Lord. It’s a beautiful thing. Known as “wats,” hundreds of temples are in the business epicenter of Bangkok. With many Thai people having a Buddhist background and believing in reincarnation, it can be hard for them to understand eternal life in Jesus. While living in Bangkok over the past year in preparation of the upcoming Festival, Forbes has found it to be very different than his time spent in Chiang Mai. With a population of over 8 million, Bangkok is not only the largest city in Thailand, but also is an “up and coming city” according to Forbes. He’s heard people refer to it as the “new Singapore” but with a cheaper economy. However, the massive population comes with a tremendous amount of traffic, making it difficult to go from place to place in the city. It’s also created geographical challenges for those trying to prepare for the Festival. As a result, the Christian Life and Witness Course training—instruction for those who desire to be prayer volunteers at the Festival—was offered in 105 locations across the area to nearly 7,000 people. Additional preparations for the Festival include close to 600 churches participating in a discipleship tool called Operation Andrew, which encourages believers to build relationships with others and invite them to church and the Festival. One of these churches decided to intentionally challenge its members to pray for their Operation Andrew friends for 21 days and invite them to attend a special Sunday service. While 137 Operation Andrew friends came, 112 of those came forward to follow Christ and 90 are now in follow-up classes. This means revival isn’t waiting for the Festival to start—it’s already happening now—and Forbes is praying it will continue long after the event ends. Pray for the final details to come together before the Festival, especially as it follows the holidays. According to Forbes, “All churches shut down at Christmastime in Asia,” meaning participants are having to jump back into Festival preparations. Pray that those who have been invited to come to the Festival will attend, not being discouraged by the enemy. Pray for Franklin Graham as he prepares to speak to the Thai people. Pray that churches would diligently disciple new believers, and new Christians would have a desire to pursue their faith. 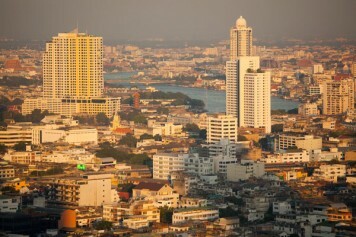 Pray for revival to start in Bangkok and reach across Thailand.